Symphony Summit is an advanced and intelligent cloud-based ITIL service management platform that utilizes latest innovations in IT technology including mobility, analytics, and automation to enable IT service firms and CIOs enhance the productivity of their IT service operations while bringing down their operational costs and removing usual complexities involved. With Symphony Summit IT Service Management, users are able to build operational intelligence via contextual data correlation from various systems. The operational intelligence it gathers afford IT analysts with more enhanced situational awareness of their IT infrastructure and provides them with recommended corrective actions to issues and problems in real-time. Other powerful features include a flexible and comprehensive Runbook Automation (RBA) engine, gamification, and feature-rich Android and iOS mobile apps for continuous productivity and unhindered access even when on the go or away from the office. Symphony Summit IT Service Management gives you and your IT service company a robust, powerful IT service management platform to help you address the ever-growing list of requirements from your clients that revolve around greater IT sophistication and intuitive responses while keeping expenses low. The software makes it possible for IT organizations to deliver premium IT services and applications that meet client specifications and requirements while addressing shrinking budgets and compliance. Via its Productivity 360 engine, you and your team are treated to a host of effective employee engagement tools, including operational intelligence, contextual information, knowledge management, pattern analysis, service automation, gamification, and more. With Symphony Summit IT Service Management, you and your IT crew are able to work effectively and efficiently as you have access to all information that can help you with your current tasks. You can access all related previous scenarios, resolutions provided, related problems and associated work orders and change processes that were implemented as part of the solution so you can address the problem at hand more efficiently. Symphony Summit IT Service Management speeds up many of your processes through its auto-remediation capability. Traditionally, human practices involve testing and observing permissions and check if conditions are fulfilled before they are deemed ready for the next phase. Symphony Summit IT Service Management eliminates the need to wait as it accelerates the journey through well written and verified script. Many repetitive tasks require human intelligence but as workflows go on a replay, fatigue sets in and this result in human errors. Symphony Summit IT Service Management automates these tasks, eliminating instances of human error from the picture and helping you deliver high quality IT services and applications. What Problems Will Symphony Summit Solve? 1. The tool doesn’t hamper you with codes. It gives you an environment where the understanding of ITIL is more required rather than to have a background and skills in programming. Analysts can modify the tool as per the requirement, just by following the ITIL framework. 2. 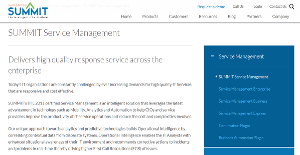 The tool simplifies service automation. Service automation greatly streamlines your processes by reducing repetitive tasks, contributing to the effective utilization of resources. Tickets with specific queue, fields, configuration can be automatically assigned to specific queue. 3. The tool offers gamification. Service Skill management and gamification enable end users to fully maximize the tool. Tickets can be routed or assigned to specific analysts who are already predefined to handle specific issues, where as gamification allows users to gauge and improve analyst skill enhancement and coaching. Each business is different, and might require a special Customer Support Software solution that will be fit for their business size, type of clients and staff and even specific industry they deal with. It's not wise to count on locating a perfect software that is going to work for each business regardless of their background is. It may be a good idea to read a few Symphony Summit reviews first and even then you should pay attention to what the service is intended to do for your company and your staff. Do you require an easy and straightforward app with just essential features? Will you really make use of the advanced functionalities required by experts and large enterprises? Are there any specific tools that are especially practical for the industry you operate in? If you ask yourself these questions it is going to be much easier to find a reliable software that will fit your budget. How Much Does Symphony Summit Cost? We realize that when you make a decision to buy IT Service Management Software it’s important not only to see how experts evaluate it in their reviews, but also to find out if the real people and companies that buy it are actually satisfied with the product. That’s why we’ve created our behavior-based Customer Satisfaction Algorithm™ that gathers customer reviews, comments and Symphony Summit reviews across a wide range of social media sites. The data is then presented in an easy to digest form showing how many people had positive and negative experience with Symphony Summit. With that information at hand you should be equipped to make an informed buying decision that you won’t regret. What are Symphony Summit pricing details? What integrations are available for Symphony Summit? If you need more information about Symphony Summit or you simply have a question let us know what you need and we’ll forward your request directly to the vendor.